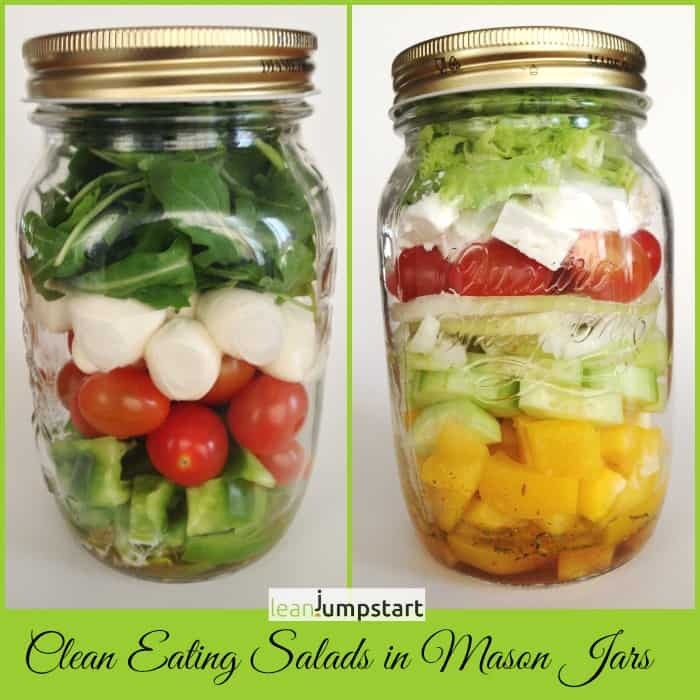 Nowadays mason jar salad recipes are popping up everywhere … and they will also be popping up here as the main part of this week’s clean eating habits challenge. I’m so glad that I stumbled across these recipes as I feel that the hype around salads in mason jars is more than deserved. It is an ingenious way to prepare a healthy and tasty meal that can last for up to five days. According to a survey I took, lack of time is a critical factor when it comes to clean eating. Many of you have a full-time job, kids, and a long commute. Your working hours are sometimes crazy and you are usually exhausted by the time you get home. You love healthy, whole foods. But the time it takes to shop for and prepare meals versus the ease and shelf life of processed foods makes it hard for you. I hear you, and I understand your struggles very well. I was in your situation many years ago, and I wish I would have known better then what I know now when facing several struggles you still might have today. Canteen food is usually convenience food, often too fatty, too salty, easy to crave, and lacking in important nutrients. A bad combination that is attracting pounds and still leaving you hungry after just a short amount of time. 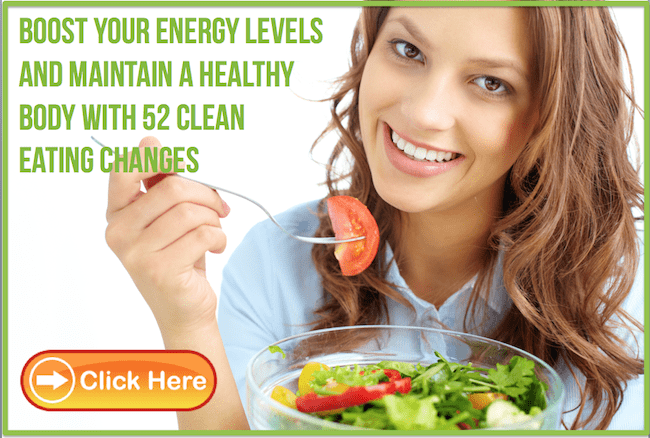 Maybe you opt for salads from fast food restaurants. It seems like a wiser step, but … did you know that they often contain processed fillers? Many fast food meals are actually sprayed with a substance to make their lettuce appear fresh. The dressings are artificial, calorie-loaded … and you pay for unwanted calories. I know that you have the best intentions when it comes to clean eating habits. But often you get derailed because of too little time or energy. And here is where jars come into play – the perfect no-excuses take-your-lunch-to-work option. You can make time on Sunday night and easily prepare a week’s worth of lunches ahead of time. If you are a work at home mum like me, you will love it as a great dinner option as well. It is a no-brainer on busy evenings with sports or other activities. Depending on the ingredients, a jarred salad will last at least five days, some even longer with the lid sealed tightly. It all comes down to the right packing method, more about this below. Don’t salad jars just look beautiful, vibrant and bright? You can’t deny that you also eat with your eyes. It’s so easy to assemble a layered salad that even a child could do it. You can mix and match so many different vegetables and grains that you’ll never get bored. The same is true for the limitless dressing variations. You know that a clean eating salad adds fiber and bulk to your nutrition while filling you up on only a few calories. Such a meal makes it easy to control the size of your lunches. 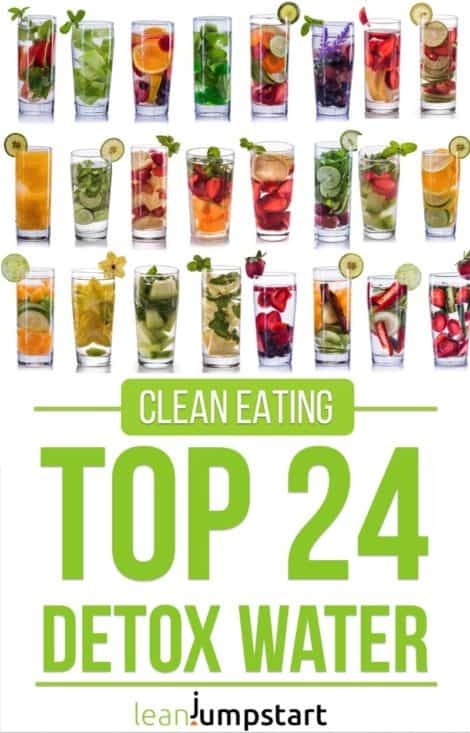 It is also a perfect habit to support your clean eating lifestyle. Mason jars are a breeze to wash, dishwasher safe, reusable, stain-proof, and portable. With glass, you avoid the concerns over toxins being spread to your meal from plastic containers. Show me a cleaner storage solution? On top of all that, they help you keep your refrigerator organized. Dinner leftovers like chicken breasts, rice, whole grain pasta, bulgur or lentils are all great ingredients that add protein and/or fiber to mason jar salads. Buying your lettuce and vegetables in bulk saves you money. Another advantage: as you use the produce immediately, you won’t be letting food go bad. On top of that, mason jars are very affordable. Recent research shows that people who pack their healthy lunch instead of eating out every workday save around $2,500 each year. Below is a simple 5-step habit change that will help you automate your salad intake. Use Sunday evening as a trigger. Put in an hour of effort and this will see you through the coming working week. Print out my quick and easy recipes below, or research other favorite salad jar recipes on the web. Put the necessary ingredients on your running shopping list and buy them on your next shopping trip (preferably on Saturday or Sunday). Develop the routine of making meal prepping salads for your week all at once on Sunday. Feel free to experiment a bit. For best results, follow the six rules below. After one working week of jarred salad consumption, buy yourself an attractive “jars to go” lunch tote as a reward. These extra-roomy neoprene bags insulate your food on the go for up to 4 hours. Various designs and different sizes are waiting for you! 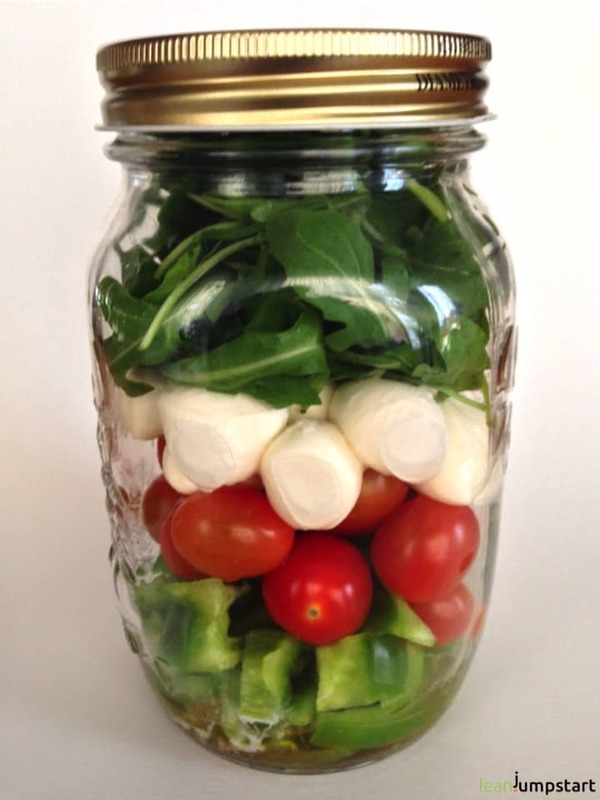 Fill each jar with the ingredients starting with dressing then adding peppers, tomatoes, mozzarella cheese, finishing with an arugula leaves layer. Store them in your fridge. When ready to eat, give the salad a shake and pour into a bowl. To keep longer fresh, pack the layers tightly without much air in between! For vegan style you might want to replace mozzarella with black beans. Keeping the salad dressing separate from your leafy vegetables is essential for longer preservation. Start with your salad dressing as the first layer and you will never risk a soggy salad experience. Continue with the next layer containing the heaviest and most non-absorbent salad ingredients like cherry tomatoes, chickpeas, cabbage or carrots. Layer your vitamin bomb with your preferred ingredients. 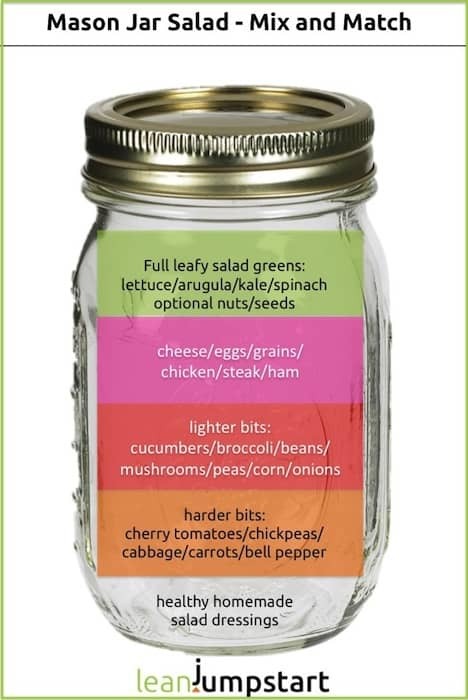 The canning jar salad mix and match chart above provides you with ideas for each layer. Pack the layers as tightly as possible. The less air between layers, the longer your salad remains fresh. The last layer is usually made of greens. For best results, use full leafy greens that you have dried before in a salad spinner. Place a folded paper towel on top of the salad before closing the jar with the lid tightly. This will help absorb moisture and prevents the leafy vegetables from wilting. If you are including nuts, add them last. Store it up to five days in the fridge until you need it. When you want to eat it, just put all the ingredients into a big bowl and toss them gently. If you haven’t yet heard of salads in a jar, that’s okay. Better late than never. If yes, have you tried them yet? At the moment I’m a big fan of the protein-rich quinoa salad in a jar. Please share your favorite recipe creation with us! You are welcome Kim! Your wonderful Jars to Go bags complete the Mason Jar Salad Lunch Idea perfectly. Especially the transportation issue was the biggest objection regarding mason jar salads. You created a smart solution, thank you so much!